I know it’s coming down to the wire but I couldn’t let another Thanksgiving go by without giving you one of my all-time favorite Thanksgiving side-dish recipes. 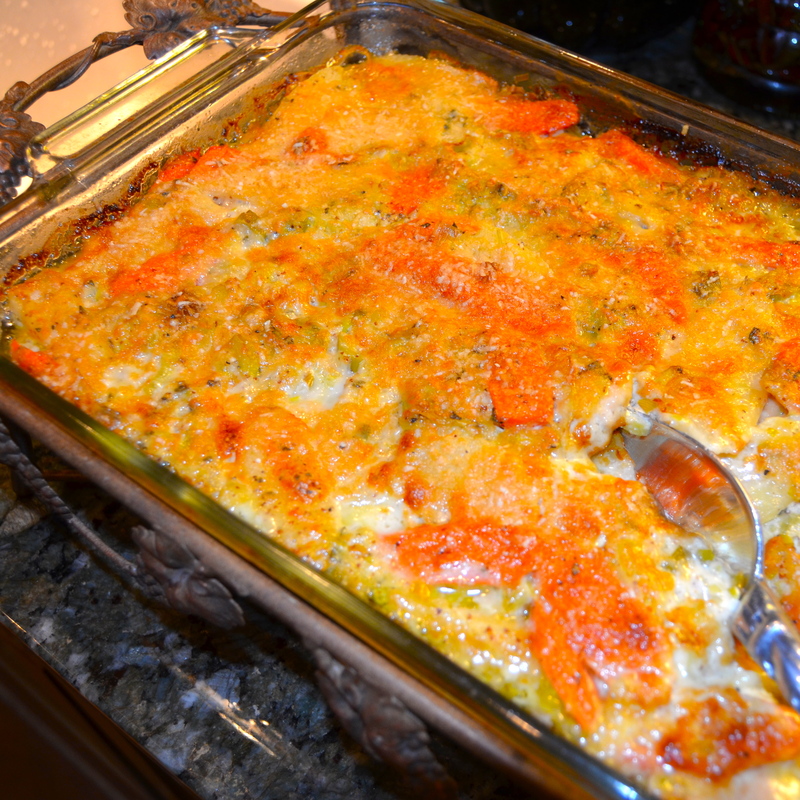 It’s a Parsnip, Carrot and Leek Gratin that is a staple in my Thanksgiving recipe repertoire. It’s crunchy and creamy at the same time, with a herbal kick from fresh sage. Everyone loves it and I think you will too. My Sou Chef son Nathan likes to slice and dice so he gets the honor of making this all-time-favorite dish for our family every Thanksgiving. And now he’s going to show you how to make it. and 1-1/2 lbs large peeled carrots. 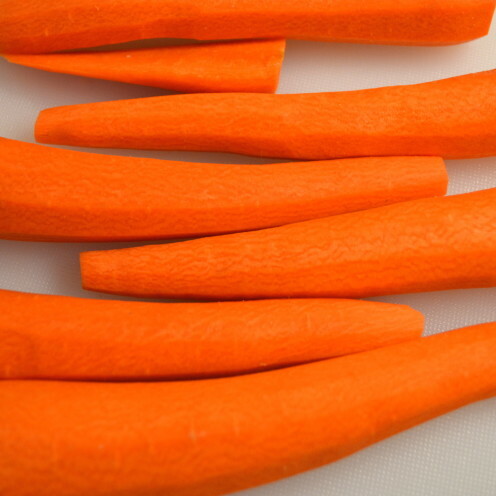 Cut them lengthwise into 1/4″ thick slices. Then cut the slices in half so you end up with wide slices about 2 to 3 inches long. 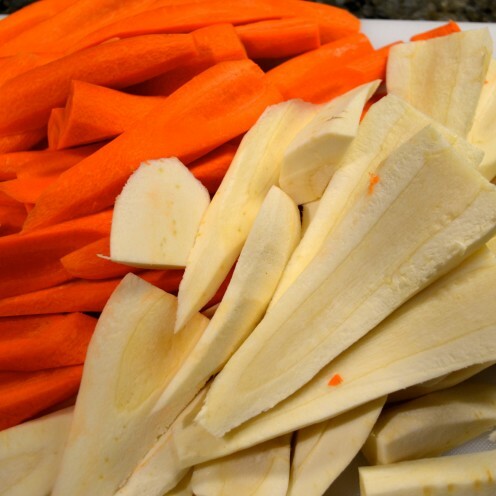 Add the parsnips and carrots to a large pot of salted, boiling water and cook for about 4 minutes until they are al dente tender. Do not overcook them as you still want them to have a crunch! Then drain them and set them aside. Next you will need 2 lbs of leeks, about 5 cups. 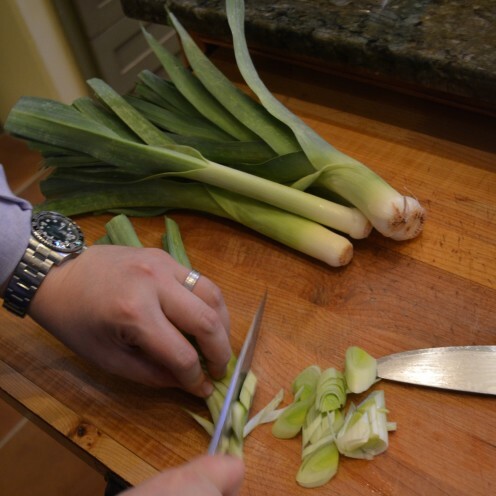 Using only the white and light green parts, slice the leeks on the diagonal into 1/4 inch pieces. Leeks can be very dirty and full of grimy soil. 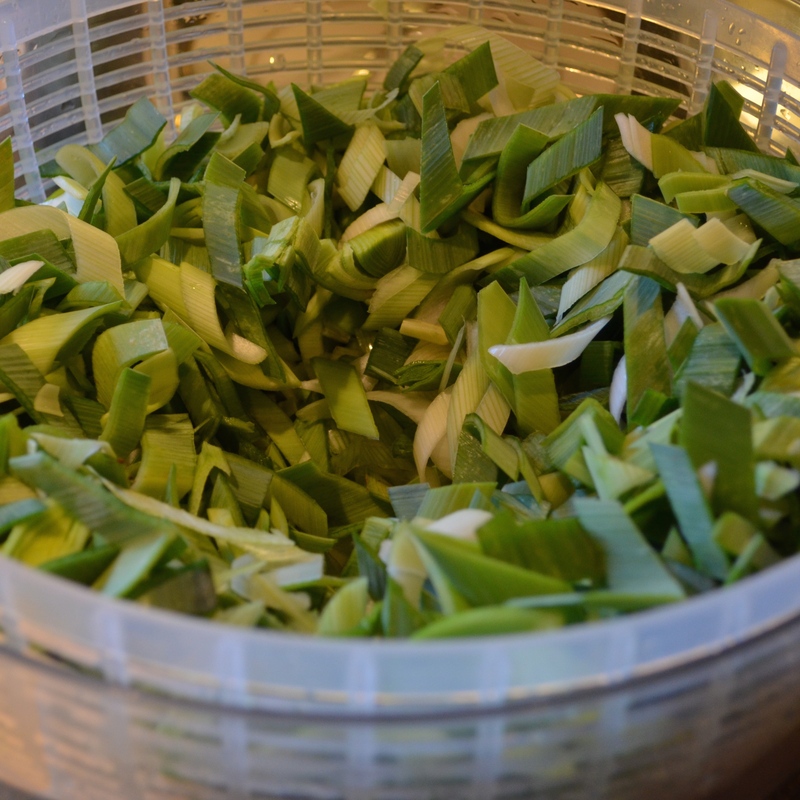 For this reason I transfer the sliced leeks into my salad spinner, give them a very thorough washing and then spin out all the water. I don’t have a photo of this but the next step is to melt 2 tablespoons of butter in a large skillet. Add the leeks and saute them over medium heat until the leeks become tender, about 15 minutes. 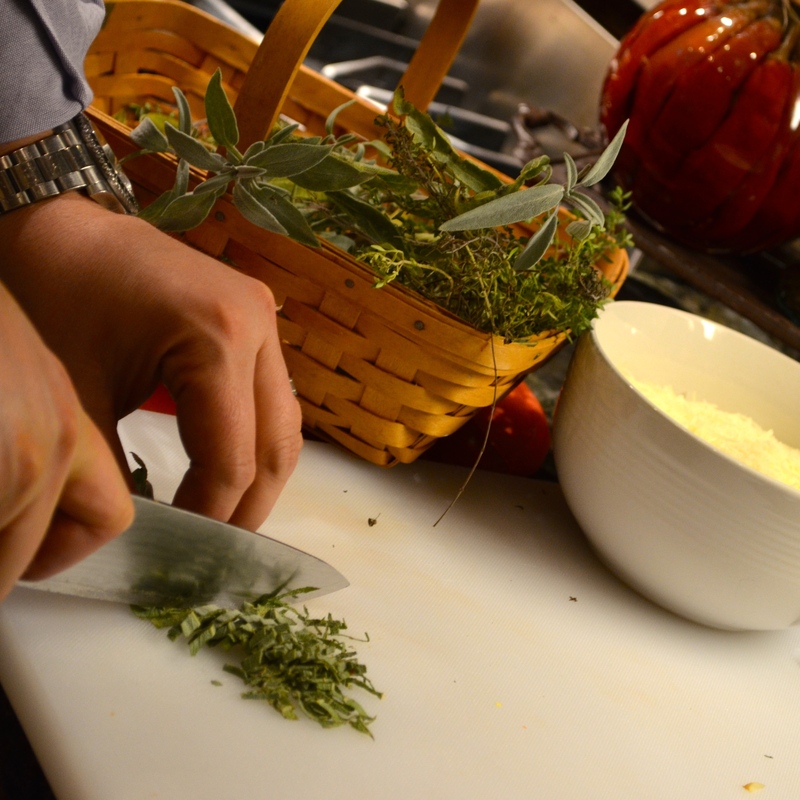 Next, dice 2 tablespoons of fresh sage and place it in a large mixing bowl. To the bowl with the sage add 2-1/2 cups of heavy cream, 2 teaspoons of country dijon mustard, 3/4 teaspoon kosher salt and 1/2 teaspoon freshly ground pepper. Stir gently to combine. Transfer to a buttered 13 x 9 x 2″ glass baking dish. 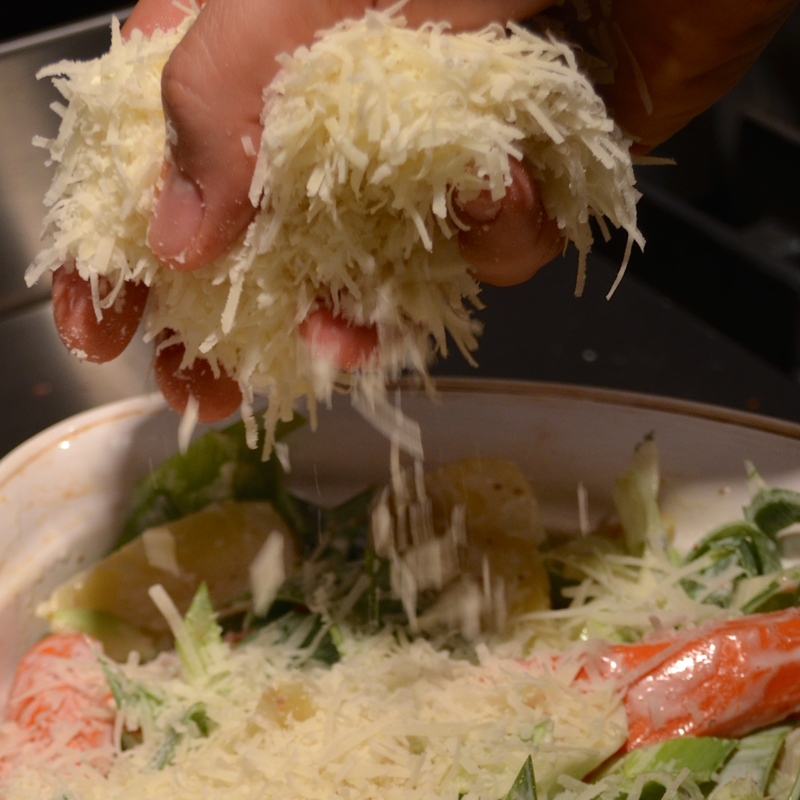 Sprinkle on 1 cup of coarsely grated good quality Parmesan cheese. Cover the dish with foil. 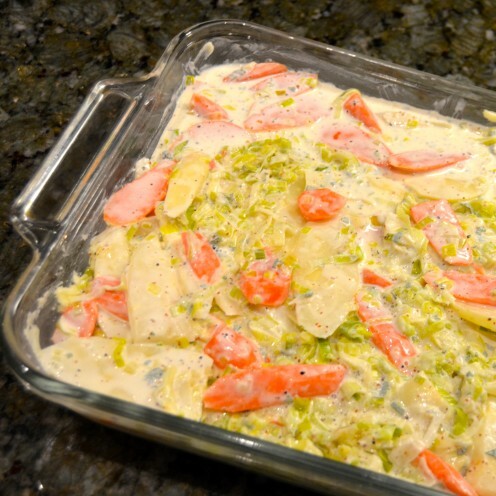 If you have planned ahead and are making your Parsnip, Carrot and Leek Gratin a day or two in advance, you could place the dish in the refrigerator until ready to bake. Otherwise, place it covered into the oven, preheated to 400º F, and bake for 30 minutes. After 30 minutes remove the foil and bake for another 30 minutes until the vegetables are tender, the cream has thickened, and the top is golden brown. Let it stand for 10 minutes before serving. 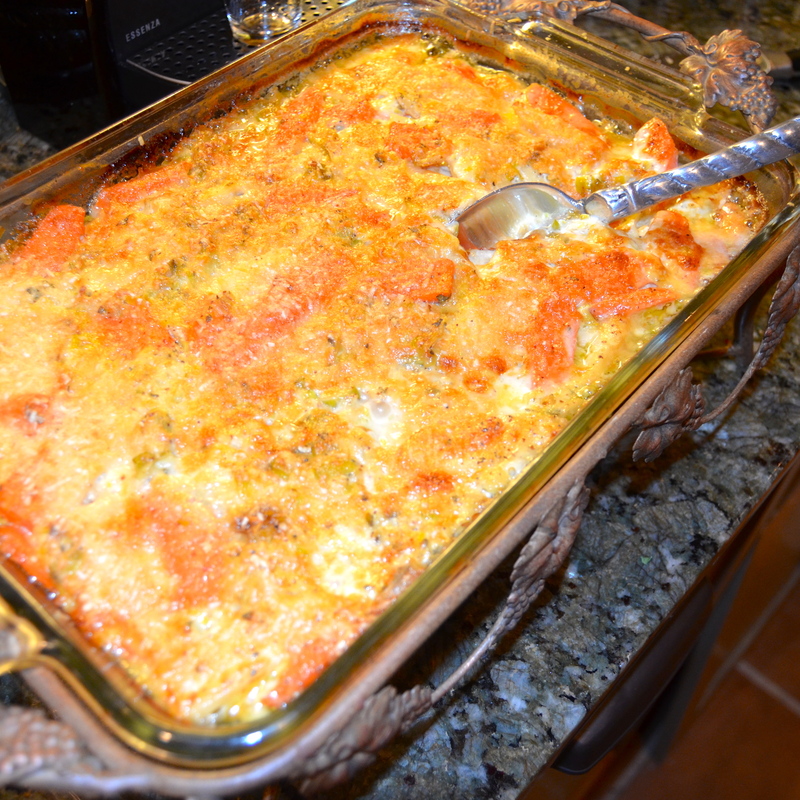 Our family has a Thanksgiving tradition that involves this dish. The day after Thanksgiving I always throw a belated Birthday party for my son Nathan. His birthday is earlier in November, and since he lives in DC, I am seldom with him on the big day. So, every year for his Birthday dinner I gather up my Thanksgiving leftovers and make Turkey Pot Pies. I do this by dicing up leftover turkey and throwing it into a bowl along with the Parsnip, Carrot and Leek Gratin, the stuffing and gravy. This mixture goes into ramekins topped with pastry dough and is baked, making wonderful turkey pot pies. Oh and one more thing I just had to share: Bon Appétit Magazine’s Modern Guide to Thanksgiving Etiquette. I think every single person in America who celebrates Thanksgiving needs to read this! It covers anything and everything you would ever want to know or should know about holiday Do’s & Don’ts. I’d love to make it required reading for my family and I have even given thought to reading it to them at the table but I fear that would be a “Don’t”! This delicious crunchy yet creamy recipe makes a great Thanksgiving side dish. Prepare it up to two days in advance, relieving some of the stress of holiday cooking. 1 Cup Coarsely Grated Good Quality Parmesan Cheese. Butter a 13 x 9 x 2" glass baking dish. 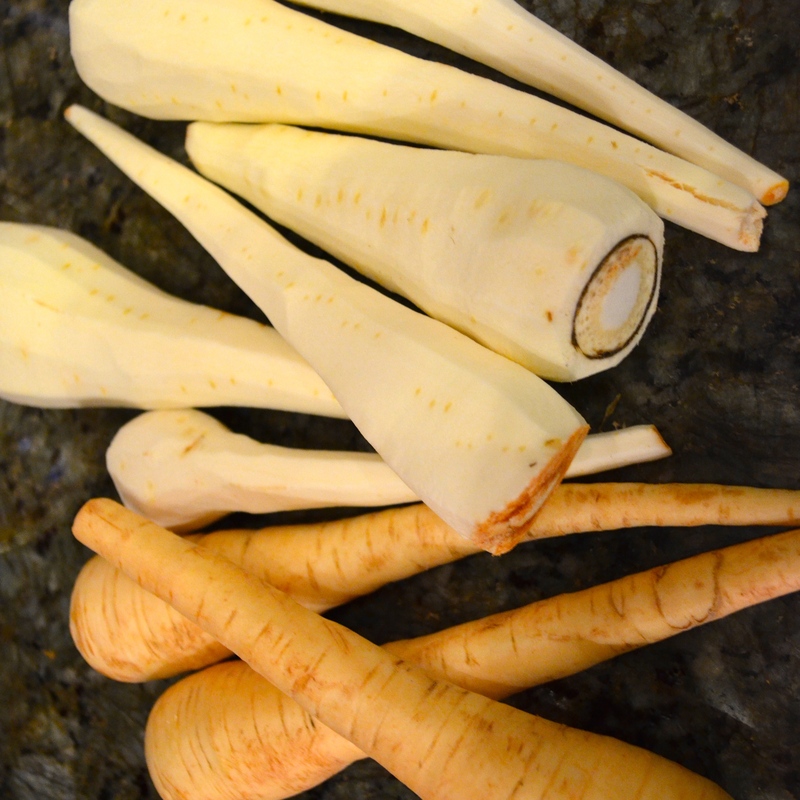 Place parsnips in a large pot of salted boiling water and cook until al dente tender, about 4 minutes. Melt butter in a large, heavy skillet. Add leeks and saute over medium heat until tender, about 15 minutes. In a large mixing bowl combine the sage, cream, mustard, salt and pepper. Add the parsnips, carrots and leeks into the bowl with the cream and gently mix to combine. Transfer to prepared baking dish and sprinkle with parmesan cheese. 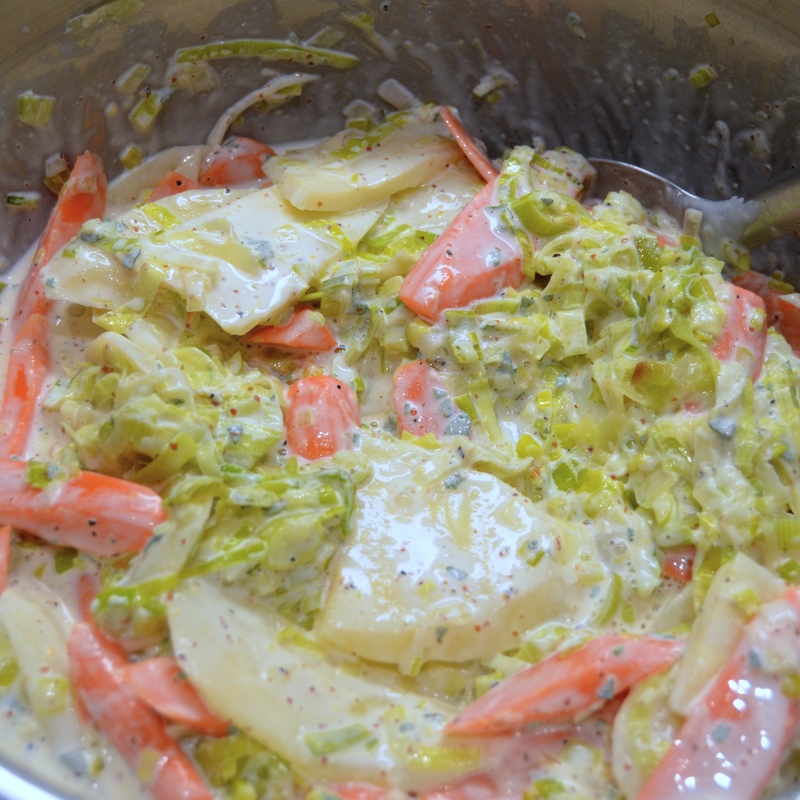 Uncover and continue baking until vegetables are tender, cream has thickened and top is golden brown. Let stand for 10 minutes, serve hot.